Address: 414021, Astrakhan, Naberezhnaya r. Tsarev, 119. Zapovednik Astrakhansky is situated in Astrakhanskaya Region. Founded in 1919; area 66,8 thousand ha, situated in the lower part of Volga Delta, with lowland on the shores of the Caspian. It has three parts: the western Damchiksky, the central Trekhizibinsky, and the eastern Obzhorovsky. The relief is that of a lowland river valley, cut with a number of different channels. The part of the delta above water is the area of the Caspian Sea where the lowland Volga's silt accumulates. The Volga Delta is one of the most dynamic in the world, with a specific hydrological regime resulting from the interaction of the huge river with a closed sea basin. The vegetation has an intrazone, typically delta character. 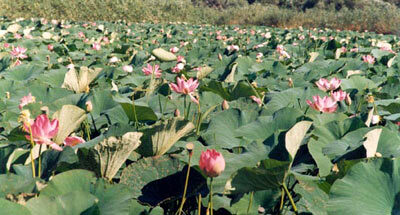 Very widespread are the thickets of caltrop, a lotus species in the Red Data Book of the Russian Federation, Nymphoides peltata, white water-lily, and others. 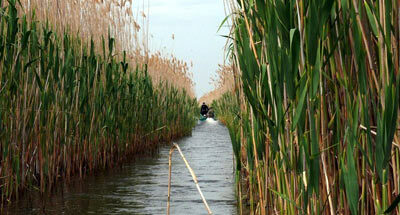 Large areas are occupied by river meadows, formed with beds of reed, Typha angustifolia and Fhalaroides arundinacea. Marginal forests grow formed from willow; trees bushes light forests of willow, ash, mulberry; reed thickets, and blackberry bushes are widespread. 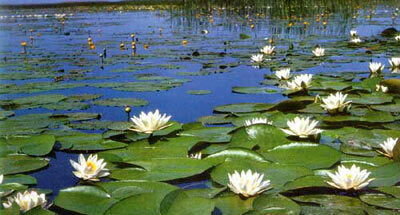 The flora comprises 278 species including 44 species of water plants. There are 30 mammal species; wild boar are the most characteristic. About 230 species of birds are to be found. The Volga Delta is a crossroad of migration paths of many waterfowl species. More than 80% of them nest in the Zapovednik, including the mute swan, gray goose, mallard duck, and diving ducks. A great number of ducks is to be found in the summer moulting period. 27 species from the Red Data Book of the Russian Federation are found in the Zapovednik: the Dalmatian pelican, spoonbill, fish hawk, white-tailed eagle, etc. Of special interest is the nesting of birds. Unusually, it is characteristic for there to be joint nesting between the common and little egret, glossy ibis, night heron, spoonbill, and pond heron. Fresh-water turtles, grass-snakes and Emory's rat snakes live in the Zapovednik; lake frogs are numerous. In the fish fauna 61 species are found; many carp species and in the migration period sturgeon and herring. Plankton and benthonic species are abundant. 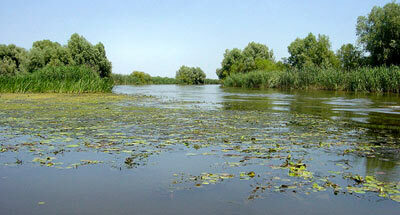 The Zapovednik is included in the "Volga Delta" wetland area of international significance. It has biosphere Zapovednik status.